Today on the blog we are passing it over to Emily of Arnold Event Styling. 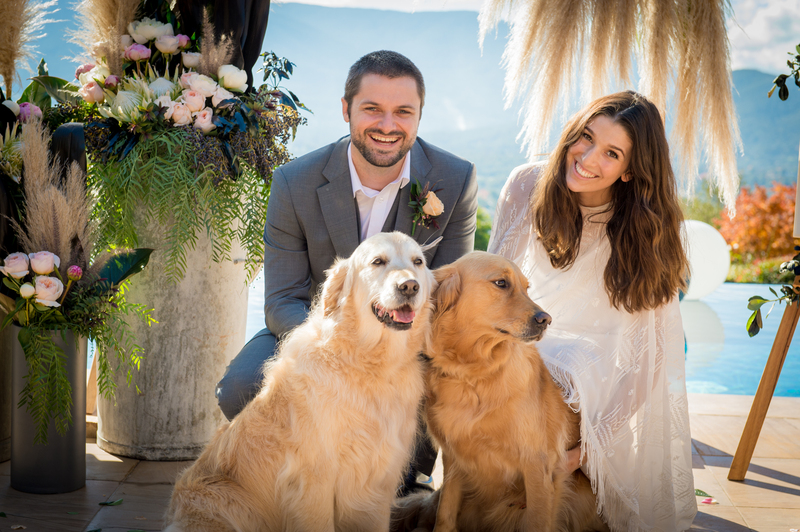 Emily recently had the fun of being able to plan and style her own wedding, and below she beautifully recounts her round up of the special day. 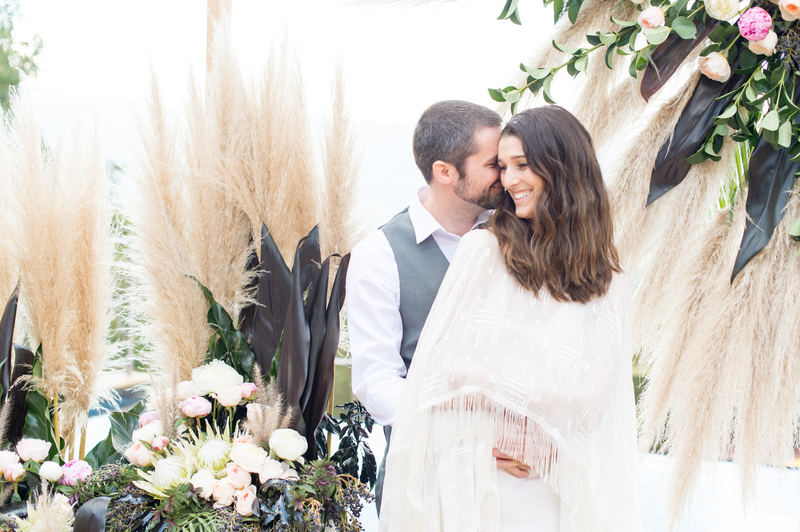 We wanted our wedding to be a casual celebration, filled with all our favourite things; good food, good drinks, good company, fairy lights and lots of flowers! And we were very lucky to be able to do just that. We found a house in Yarra Junction, Victoria, with picturesque views of the mountainside and we knew it was perfect for us. We love a good view, and the house could sleep 12 people, allowed dogs and had a commercial kitchen.– Perfect for our idea of holding an intimate family cook-up. Dramatic ceiling installations were set up in the space. As I was working part-time in the styling industry, I was super excited about being able to style our own special day. The vibe I wanted to achieve was minimal and casual, with a colour palette of black, greenery and a touch of pink. Working with my florist (and old friend) Cassie from Edward and I was so much fun – she did an incredible job and went above and beyond. In the days leading up, Cassie was spray painting foliage black to create my dream look. 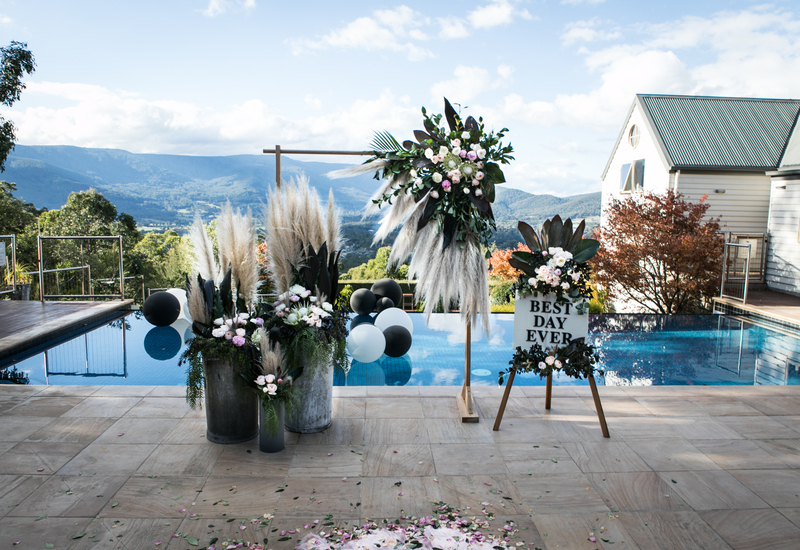 The black added some dramatic depth, which was then mixed with a touch of softness with pampas grass and pink florals. This is how you style vintage bins! Invitations As part of my engagement surprise, James had drawn a picture of us, and drawn some stencil art which represents us (he’s the lion, I’m the giraffe!) so I couldn’t wait to use these on our wedding invitations! The handmade invitations, finished off with a personalised touch. Place Cards I found some copper glass prisms on Etsy, and fell in love. They were actually meant to be ring holders, but I thought they could make some pretty cool place cards! I created the hanging part out of a necklace pendant. Adding that personal touch with these unique place cards. ‘Best Day Ever’ signage I found this nice pine board in an art store, and new I wanted to use it somehow. I ended up finding some wooden letters which I painted black. This was another simple element but effective, I think. Food was all made from scratch, and we all pitched in on the day to help make our idea of a big family cook-up come true. My sister made beautiful cupcakes (in my colour theme of course) which we decorated with roses. James’ sister made us a lion and giraffe cake, absolutely gorgeous! I also did all the sourcing of the final touches like the giant pool balloons, the dusty pink feathers and rugs, furniture, cutlery and crockery. We finished the weekend up with a few friends over on the Sunday, which really topped it off. They were all so excited and happy for us. We even made an appearance for them in our suit and dress! I’m also really glad that I got James’ friends involved for him. In the build-up to our wedding, my sister organised a ‘hens’ celebration for me. I felt so special on this day, with all of my favourite girlfriends in one room. I wanted James to feel as special as I had! Since we weren’t having friends there on our actual wedding day, I thought it was even more important to involve them for him. So, I asked a bunch of his pals to each put together a letter to James. What they came up with was awesome – drawings of the two of us, stories of him growing up, stories of how he deserves the best, and one of his friends put together a full book! He had a good laugh and felt the love, which is all I wanted. His friends said to me it was nice that they could be involved somehow, too. I put these in a box for him, which was titled “A little bit of man love on your wedding day”. I love my dress! My good friend Kristen, from Dressmaking and Such, made my dress, a cape, a surprise bridal robe for me, and James’ pocket square out of my dress fabric. My dress was super simple, a tiny train and pockets (yes!). The cape was beautiful and floaty, I felt so special. I absolutely love everything Kristen made for us – the fabrics, gahhhh. There’s no rule against wearing a wedding dress to work right? The bridge being walked up the aisle by both mum and dad.